This piece was written by Jennifer Koshak and was originally shared on Unfold & Begin. When I was 42, I found myself single and not sure what to do. I knew I wanted to do things, go places, but I didn’t know how to do them alone. Luckily, I have great friends and they helped me to get out the door. 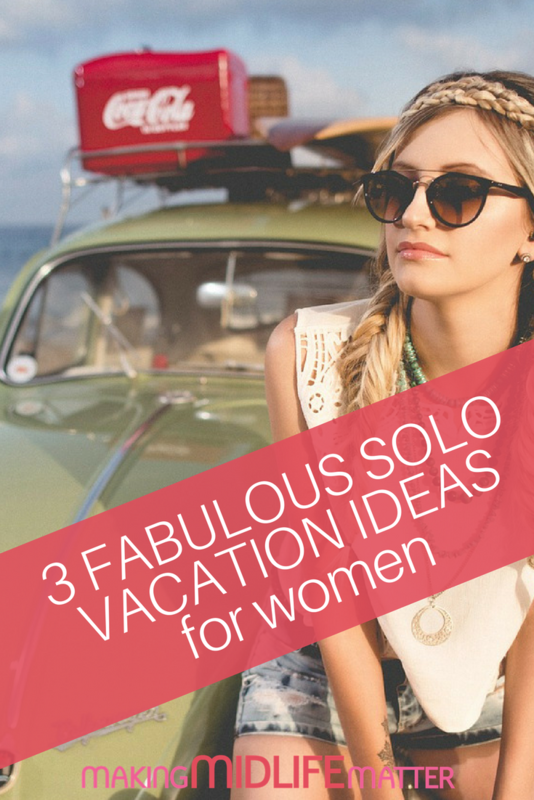 And below are are options for 3 solo vacations that might help you get out the door too. 1. Plan trips with friends. Ok, so this isn’t technically alone, but when you find money tight, while still wanting to do something, plan a weekend trip with your friends. Living in New England, my friends and I would plan an overnight in Vermont or New Hampshire during the winter and then cross country ski the following day and drive home at the end of the day. Just a quick get-away, but so worth it. Nothing is better than laughing with your friends. 2. Join a hiking club. One of my friends convinced me to join the AMC (Appalachian Mountain Club) by gifting me the membership for Christmas. The AMC is a conservation organization that helps to maintain the trails and the environment along the AT, but it’s also a recreational organization. Right now there are 12 local chapters from Maine to D.C. In New Hampshire, the activeness of the AMC can be seen in the White Mountain area, especially around Mt. Washington. They keep a lodge–Joe Dodd– at Pinkham Notch at the base of Mt. Washington and one on the other side of the mountain—Highland Center—at Crawford Notch. The AMC also maintains several huts along the Appalachian Trail in the White Mountains and it’s to these huts that my girlfriends and I would plan hut hiking trips (yes, still part of #1, traveling with friends,) and it was to one of these huts that I hiked with some friends after I quit smoking. This in turn, became a yearly hut hiking trek with my girlfriends. The AMC has many offerings: guided hikes, family adventures, mountain safety classes and even photography classes. Each time I’ve participated in a program I had fun, met new people and most importantly, as a single woman traveling alone, I felt safe. I’ve discussed the AMC, because as an east coast girl, that’s what I know. There are other programs out there that are like it, such as the Pacific Crest Trail Association, or you can try REI Adventures which also offer various programs, including volunteer vacations. Go and get out into the woods! 3. Find a travel company that caters to women. Journeywoman is an online travel magazine and travel resource for women. Journeywoman was created by Evelyn Hannon because she couldn’t find travel information specifically for women traveling alone. It includes tips from other women on the best places to stay or eat while traveling to any country, tour information and even how to pack for specific countries. You can sign up for a newsletter that comes on a regular basis and includes recent information. For instance, the latest newsletter includes information on safe travel for women in Barcelona and Madrid as well as an article on hotel safety tips. I will admit, I never got to the point of using any of the tours through Journeywoman, and nowadays I travel with my husband—when I do sneak out without him, it’s usually hut hiking trip with my girlfriends. But, I still read the articles and take note of precautions and safety tips (valid for anyone) but the tours and travel groups are geared towards women and solo travelers. So get out there. Plan a trip, do the research, utilize the vast tools that are available online and go somewhere new, or learn a new skill or meet some new people. You’ll have fun.